About Cemaliye M. Message Cemaliye M.
Cemaliye is a fabulous tour guide. She is very knowledgable about Cyprus and made the tour very interesting. She was very flexible with the time, and a very safe driver. I would hire again and highly recommend her. She is very kind, she is thinking of our conditions. We fully enjoyed our tour. Thank you so much. Cemaliye was very knowledgable about the history of Cyprus and also of Hillarion Castle and Bellapais Abbey. The halfday trip went by very fast. Especially the castle is very interesting and compared to its age is in a much better condition than many castles in Britain. Cemaliye M was a joy to spend time with. She was punctional a good driver and really knew her stuff. 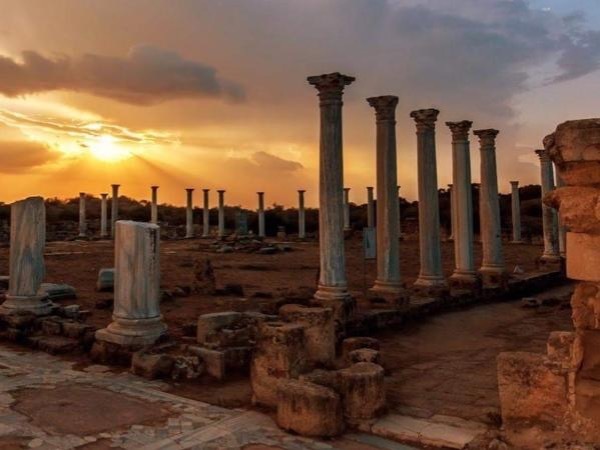 For us she really enhanced our holiday in Cyprus and we finished the tour with a much better understanding of how history has repeatedly swept across the island. Her recommendation for lunch also a winner. Personable and competent, I can only give Cemaliye an outstanding recommendation. Cemaliye made our stay in Cyprus an unforgettable experience. She is well connected in Northern Cyprus, and was able to take care of us and show us some of the most beautiful cites of this incredible island. She is thoughtful, well prepared, and caring. She had always an open ear for our question and was flexible to accommodate our needs. We recommend her, and would use her services when we come back. We had a fabulous time! Cemaliye is the best guide we've ever had! My husband and I have traveled the globe and she is undoubtedly the most knowledgeable, professional and kindest tour guide we've ever had! I'm so happy we chose Tours by Locals. Our guide was very informative and patient. It s only way to travel toNicosia . She knew all the best shops also which made my wife very happy. I I will use there. Services from now on. When you have a private guide you do 2x more.so thank you to Cemaliye. Cemaliye was an excellent driver/guide for historical and current information. Lots of energy and fun. Great tour! Highly recommend for anyone travelling within the area. In Northern Cyprus we spent our free day with Cemalye to visit places our organised tour did not cover. With excellent English, she was knowledgeable, warm, kind and considerate, always giving us options of things to do. It was a great insight into the history, life and people of Northern Cyprus. The whole experience was magical, like a day out with a special friend not just a guide. We were so pleased to have met her and we strongly recommend her as a guide - we are sure you will not be disappointed. Cemaliye was somewhat disorganized. Was late for the meet up and failed to let us know passports were required. Weak on suggestions when itinerary was altered. Her English was a little difficult to understand. TOUR GUIDE RESPONSE: Dear Thomas, Primarily, I am so sorry and gutted to hear that you feel that way.. The only reason I was late , due to the change of Arrival department of the Cruise Port moved a much further away as I explained on that day by showing the original waiting arrival point.Regarding the passport for crossing the border was an optional as a good gesture as nothing to do with the itienary. Only if you wanted to see the other side. Even though I explained to you that you didn't miss anything by not crossing it. We went on a tour with Cemaliye. She went above and beyond to be so helpful and give us a wonderful tour of Northern Cyprus. She added in an extra place to my tour so that I could return to a place I hadn't been to for 30 years. She was flexible, knowledgeable, and very informative. She took us to some amazing places. She booked a table at a lovely restaurant in Bellapais for lunch. I really couldn't have asked for a better tour guide. I would highly recommend Cameliye. Thanks for a wonderful day. I had an outstanding tour by Cemaliye for two days through the Northern Turkish Side of Cyprus. She was prompt and always willing to go the extra mile, coming to the Greek side to fetch me both mornings instead of starting at the border. She also was kind enough to drive me to my Larnaca hotel at the end which saved me time money and a long taxi ride. Cemalliye is very knowledgeable about the archeology and history, her English is perfect and a very safe driver. I highly recommend her to visitors, 5+! Tour was amazing. Came is very knowledgeable and had some great little bits of info we never would have gotten out of a book. She also was very accommodating to our needs due to the heat during this time of year. Highly recommend her!! TOUR GUIDE RESPONSE: Dear Katharine, I appreciate your positive feedback about my tour. Thank you for giving me a perfect rating and for recommending my tours to other travelers and also taking the time to review it. I am very pleased to hear that you had a pleasant day and it was my pleasure of having the tour with your family. Looking forward to seeing you again one day. Fantastic insight into history and what Cyprus has to offer. Cemaliye is a very experienced guide, who allows you to wander and take your time to dig a little draper into the enriched Cypriot history. Very careful driver. TOUR GUIDE RESPONSE: Dear Allen. Thank you for your review and for choosing me as your guide. I appreciate your positive feedback about me and very happy that you enjoyed your day. I look forward to having you both again in the future. Take care! Gemma is one of the best guides ever - So knowledge and accommodating! Overall, we as a family were unhappy with the services provided by Cemaliye. As we are only limited to 510 characters.. In summary, she is not efficient in replying emails/responding to queries; unenthusiastic with any other parts of Cyprus except for the Turkish Cypriot side, lacks time management skills & should NOT be allowed to drive a car she was not familiar with & provide guiding services. We needed a tour guide to guide us and not a Cypriot driver/housewife. She is NOT a competent tour guide. TOUR GUIDE RESPONSE: Im so sorry about your disappointment &understand that you are upset as you didn't have a chance to see anything due to non-stop heavy rain with a long drive on that date! Even though I've tried to cancel the tour because of the weather! You were also aware that I am only licensed to guide in the historical sites of North Cyprus not in the South part due to political situation in Cyprus as I warned you before you proceed with the booking! Excellent guide. Very flexible and provided us with just what we wanted. Polite, friendly and nothing too much trouble. I highly recommend tours by locals. A treat to see and do what you want at your own pace. Excellent guide who spoke fluid English. Helpful. courteous and friendly. Nothing was too much trouble. A real treat to do and see what you want at your own pace. Highly recommended. A brilliant tour with plenty to see and do. Cemaliye explained everything brilliantly and showed us what an amazing and diverse place the Karpasia peninsula was including some excellent swimming time. A lovely friendly approach without being overly familiar. Highly recommended. Well looked after and our tastes and needs perfectly catered for. The sights were well explained and plenty of options made available to us.